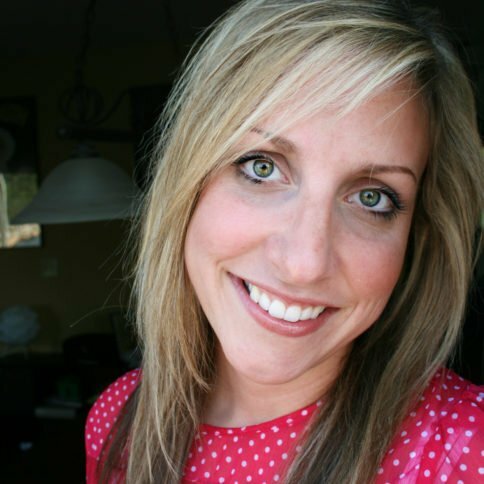 30+ ways to make them smile! Happy holidays everyone! 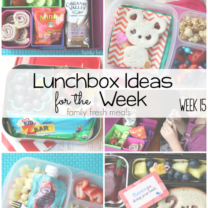 I know that this time of year is CRAAAAZY for most of us, and making fun lunches for your kiddos is probably #582 on your priority list. 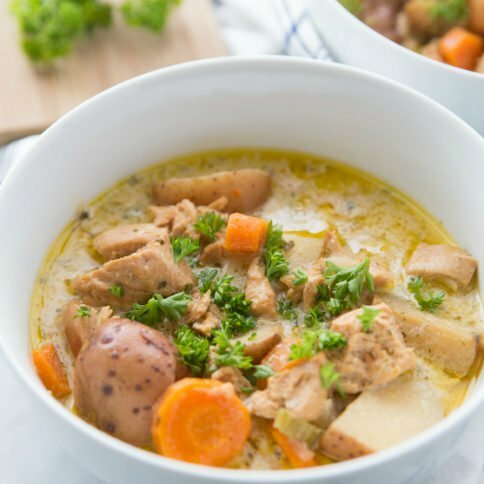 Soooooo, for my lunchbox post this week, I thought it would be helpful to show you some quick, easy and SUPER fun Christmas food ideas to pack or plate for lunch. Let’s start with food sprinkles. You can find holiday food sprinkles at just about any grocery store. What I like to do is stock-up at the end of the season when they go on super sale. 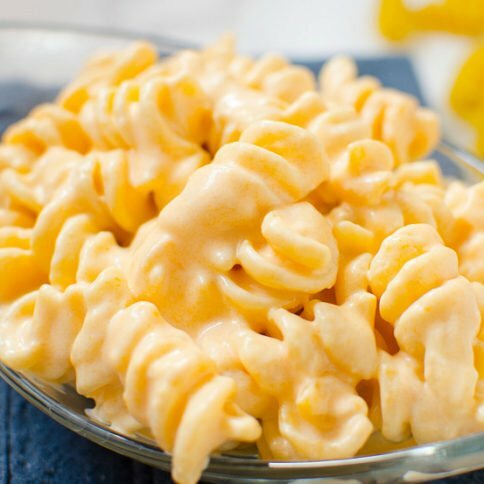 The shelf-life on these bad boys are pretty long so grab a bunch! Last time I checked, I also found a bunch at our local Dollar Store… so check that out by you as well. Ok Corey, now what do we do with all these colorful food sprinkles? 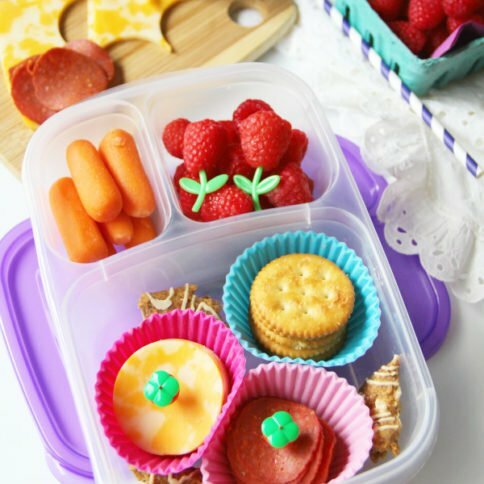 Here are some of my favorite ways to use food sprinkles to brighten up any lunch! 2. Mixed in with nuts or basically ANY snack mix. Just a sprinkle SCREAMS happy holidays! 3. 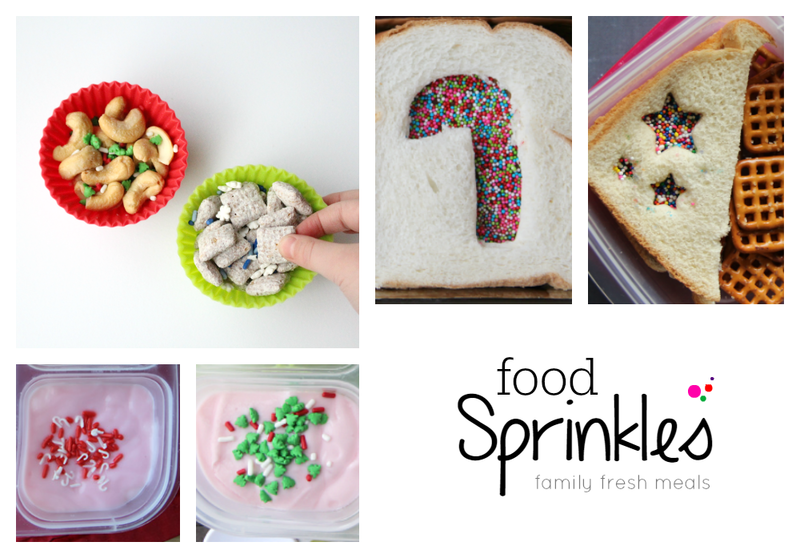 Holiday fairy bread! Using a small cookie cutter, remove a section of your top piece of bread and fill that space in with sprinkles. This works best on sweet sandwiches. Think PB & J, PB & honey or cream cheese and jelly. Green and Red Food Combos! 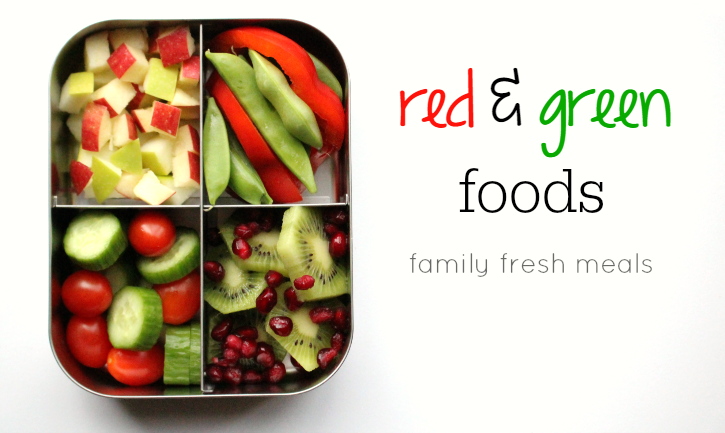 By simply placing some green and red food together, you have some instant holiday fun! 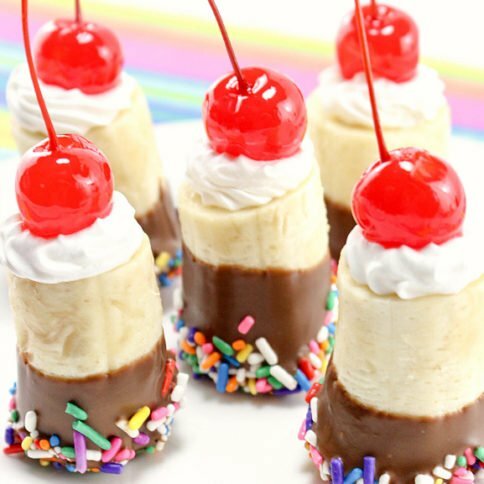 Here are some yummy combos we love! Did I miss any? 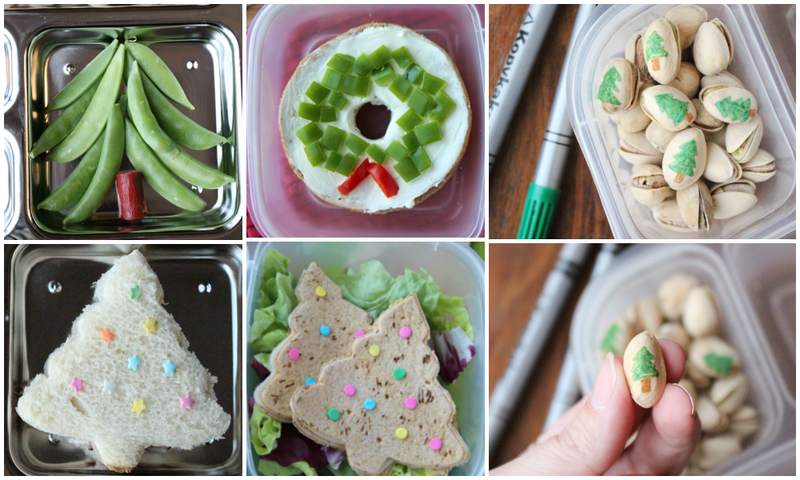 Another great way to instantly create a fun holiday lunch is with cookie cutters! 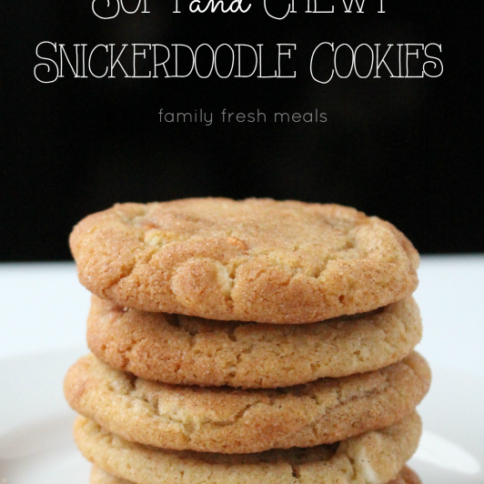 Cookies cutters can be used on…..
Do you want to build a snowman for lunch? 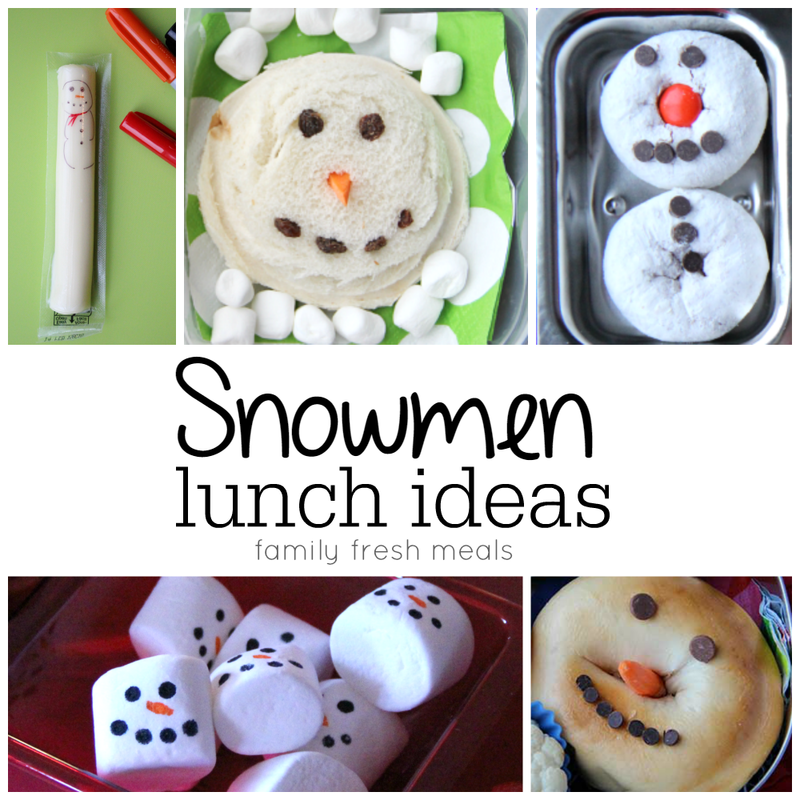 Here are a couple of my go-to lunchbox snowmen! 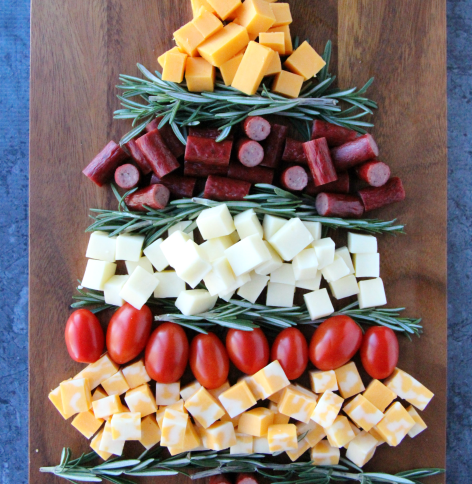 Oh Christmas tree, oh Christmas tree, you make a tasty lunchbox treat! 1. Do you have a heart shaped cookie cutter? Then you can make a reindeer sammie! Just turn that heart upside down, add some pretzel antlers and a bell pepper nose! 3. 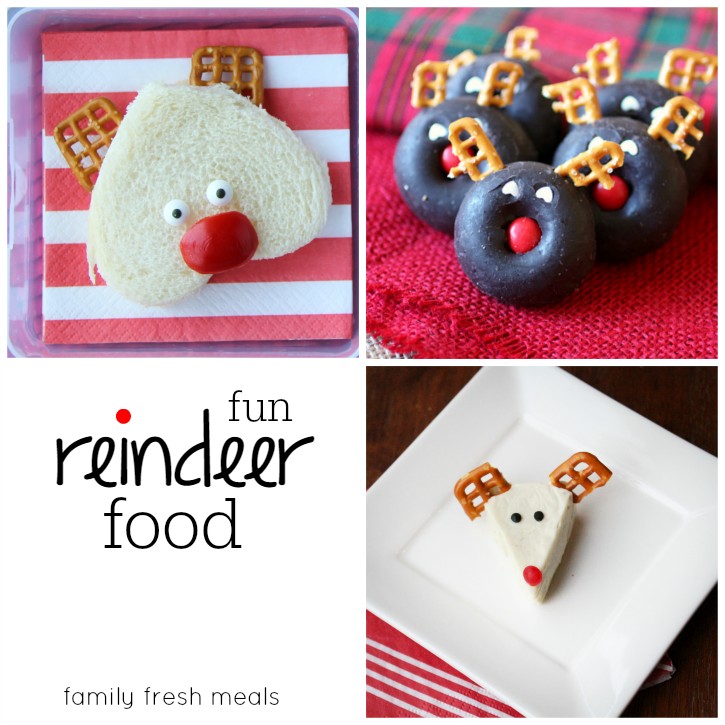 These sweet reindeer treats from SheKnows are the cutest little donuts ever! 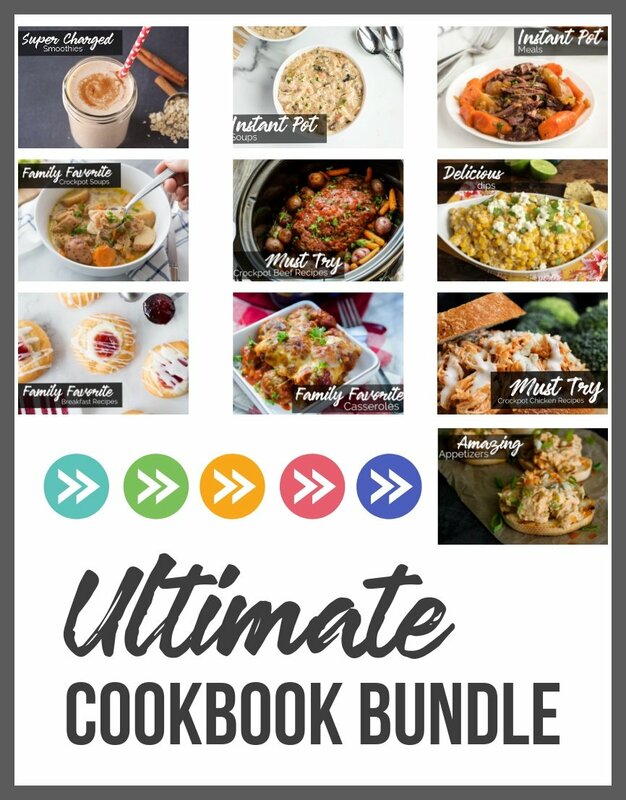 Finally, here are some other ways to add in some festive fun! 1. 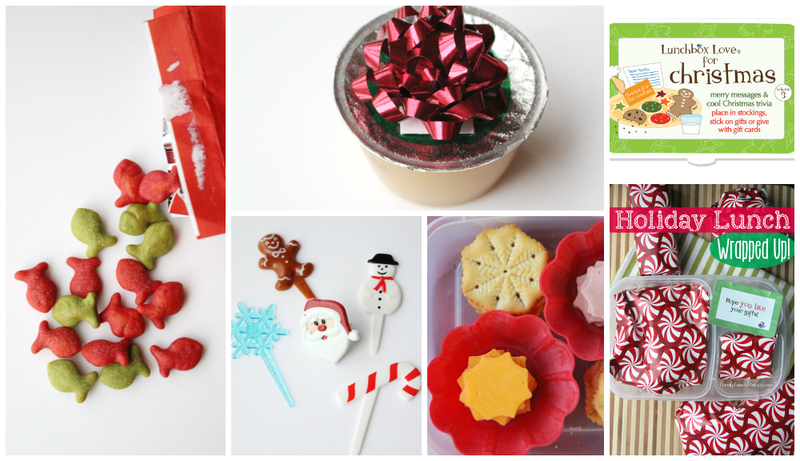 Slap a bow on any packaged food for some holiday flare. 2. Gold fish crackers make some cute green and red crackers this time of year. Throw them in for instant colorful fun! 3. Lunchbox Love Notes make a Christmas set of love notes to throw in lunchboxes. How cool is that? 4. Store bought snowflake crackers. EASY! 5. 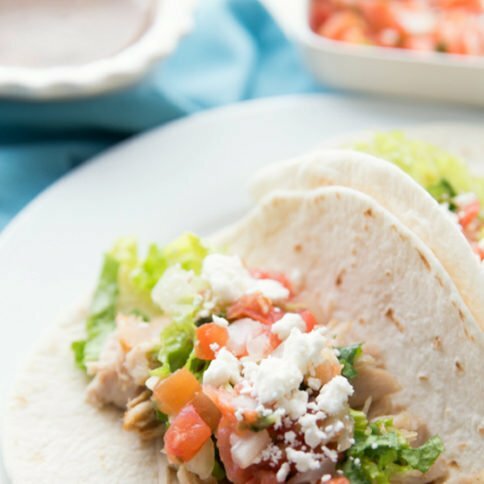 Use some holiday wrapping paper to turn lunch items into presents! Fun! 6. 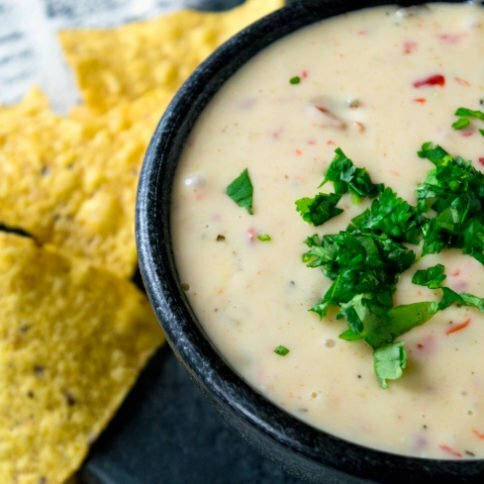 Holiday food picks are all over the place during this time of year. You can also make your own with stickers and toothpicks. 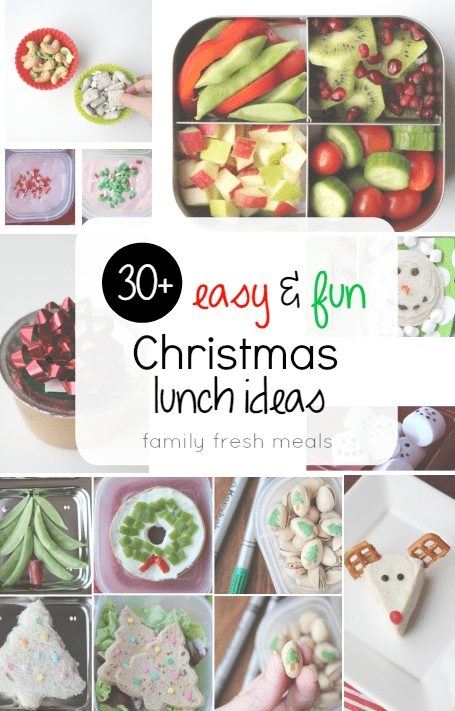 I hope you enjoy these Easy & Fun Christmas Food Ideas ! 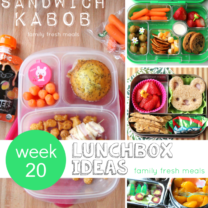 For even MORE fun holiday lunchbox ideas, my friend Wendy of Wendolonia has some more killer ideas HERE! 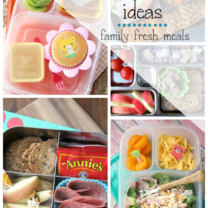 Here are some of the lunchboxes use to make this Fun Christmas Food Ideas post!